Today is the 50th anniversary of my most favorite television program, Doctor Who. 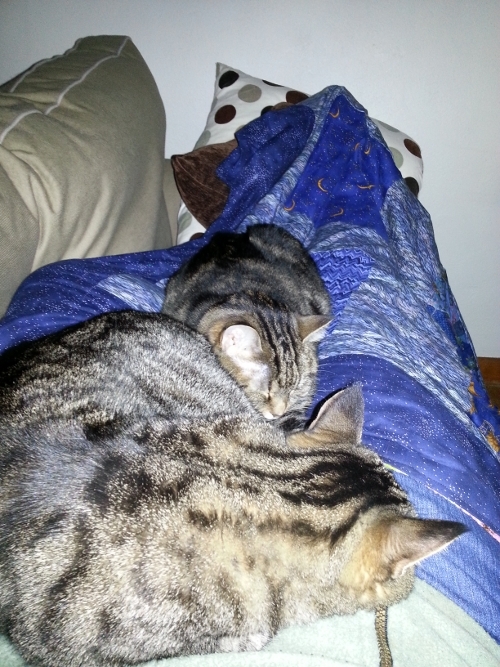 I am currently trapped on my sofa beneath two kittens and a TARDIS throw (made by elsaf's sis-in-law). We had been watching the various specials, but now they are done and I want to go to bed, but I don't want to disturb them. So I am typing this up on my phone. I've enjoyed all of the specials starting with Big Finish's brilliant Light at the End, continuing with today's phenomenal Day of the Doctor, then the impressive An Adventure in Time and Space and the predictable Ultimate Guide. But they were all blown away by Peter Davison's The Five(ish) Doctors Reboot. So funny! Thanks for fifty years of wonderful stories Doctor! Thanks for all of the friendships I've started due to your show. Here's to the next fifty years! Sounds like you had a good Who day. We enjoyed it lots. I still haven't seen An Adventure in Time & Space--was it shown on BBC America? I figure it'll be on YouTube or a torrent or something eventually.